From Decatur, take U.S.31 north, turn left onto Hobbs St., turn left at the 4th traffic light onto Marion St., we are the second door on the left. 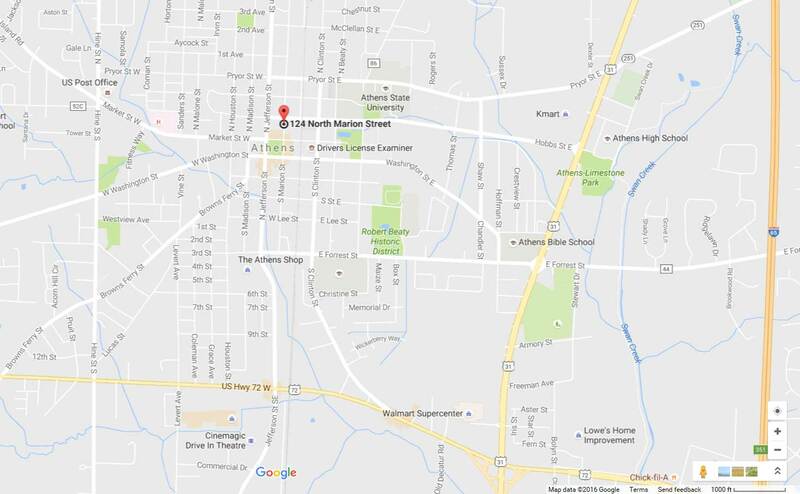 From Huntsville, take U.S.72 West to Athens (15 minutes from Madison Square Mall), turn right onto Jefferson St., turn right onto Hobbs St. (one block past courthouse), go one block and turn right onto Marion St. We are the second door on the left. From Florence, take U.S. 72 east to Athens (45 miles). Turn left onto Jefferson St., turn right onto Hobbs St. (one block past courthouse), go one block and turn right onto Marion St. We are the second door on the left. From Nashville, take I-65 south (90 miles), exit first Athens exit (U.S. 31 South), turn right onto Hobbs St., turn left at the 4th traffic light onto Marion St., we are the second door on the left. From Birmingham, take I-65 North (90 miles), exit at U.S. 72 West, turn right onto Jefferson St., turn right onto Hobbs St. (one block past courthouse), go one block and turn right onto Marion St. We are the second door on the left.